Doesn’t that pork chop look AMAZING?! I do believe that’s the thickest, most delicious looking pork chop I’ve ever seen. And it tasted every bit as good as it looks. This is actually a meal that my awesome husband made me last week while I was sick with the flu! He certainly knows how to work a grill. The only downside is that I didn’t have much of an appetite. BUT! Even though I couldn’t eat all of it (I mean, come on that’s a really big pork chop) I was still able to taste just how good it was (and enjoy it as leftovers another day). So even though I felt absolutely miserable from my head to my toes, my husband’s cooking of these crazy good chops definitely brightened me up a bit. I’ve posted a similar recipe before called Honey Rosemary Pork Chops, and it’s actually the reason I decided to give this recipe a try. The Honey Rosemary marinade was absolutely divine. Apparently pork chops and honey were made for each other because any time you combine the two, you get deliciousness. This glaze is a little bit thicker and sweeter than the first one. I’m not sure which one I like better! You should try them both and let me know which one you prefer. Cut 2 slits about 2 inches apart through fat and connective tissue around outside of each chop. Combine sugar, salt, and pepper in bowl. Pat chops dry with paper towels and rub with sugar mixture. Whisk vinegar and cornstarch in small saucepan until no lumps remain. Stir in honey, mustard, thyme, and cayenne and bring to boil. Reduce heat to medium-low and simmer until glaze is reduced to 1/4 cup, 5 to 7 minutes. For a charcoal grill: Open bottom vent completely. Light large chimney starter filled with charcoal briquettes (6 quarts). When top coals are partially covered with ash, pour two-thirds evenly over grill, then pour remaining coals over half of grill. Set cooking grate in place, cover, and open lid vent completely. Heat grill until hot, about 5 minutes. For a gas grill: Turn all burners to high, cover, and heat grill until hot, about 15 minutes. Leave primary burner on high and turn other burner(s) to medium-low. Place chops on cool part of grill and cook (covered if using gas) until meat registers 140 degrees, 3 to 5 minutes per side. Brush chops with glaze and grill, glazed side down, over hot part of grill until caramelized, about 1 minute. Repeat with second side of chops. Transfer chops to platter, tent loosely with aluminum foil, and rest for 5 to 10 minutes. Brush with remaining glaze. Serve. Source: We Call Him Yes! Chef! Lindsay, these look so good. I am craving pork chops now!! Thanks! 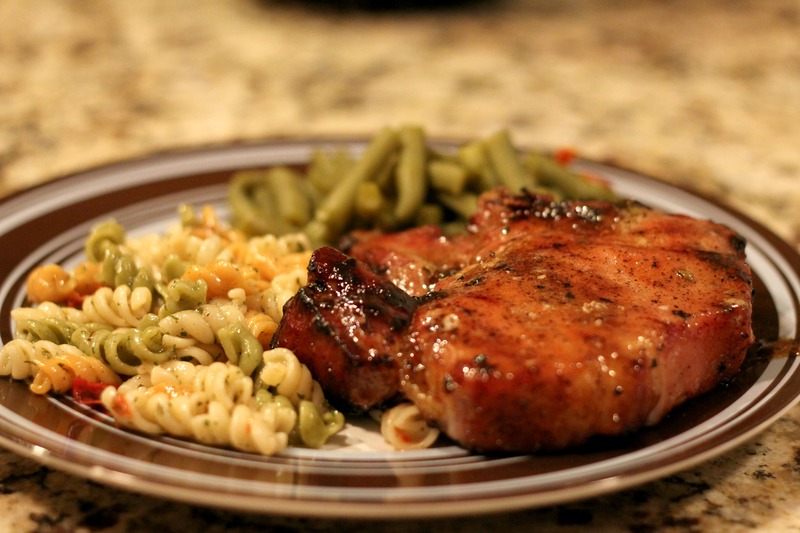 If you’re in the mood for pork chops, these won’t disappoint! Grilled these tonight for my daughters birthday dinner. They were wonderful! Happy Birthday to your daughter! This is a great pick for a birthday meal :-). Glad you liked them! Recipe looks great. 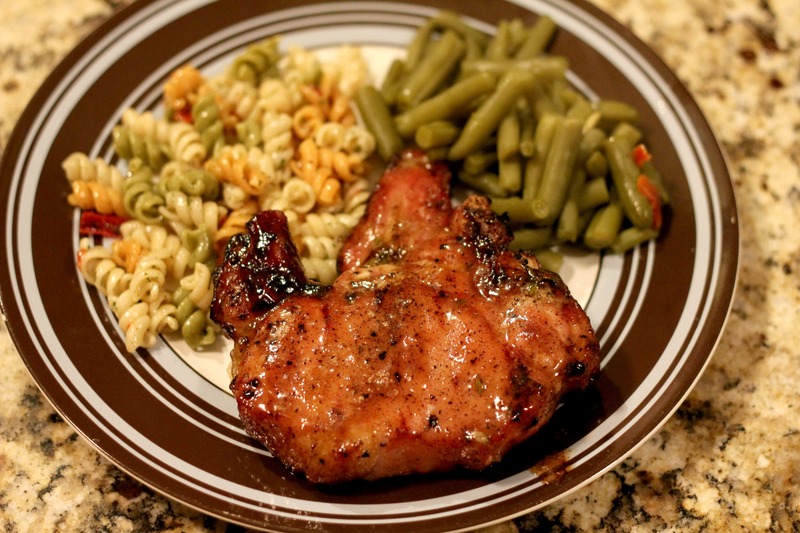 But, I am wondering why a rub that has 1/4 cup sugar and then you put a honey glaze on the chops. Is this not redundant? This is a very sweet dish. I personally love sweet glazes on meat, but I know some people are not a fan of sweet entrees. If you think it might be too much, you could reduce the sugar in the rub and just use the honey. I’m sure it’d still be good!